Topics: Pc Repair, Hard Drive Disk Data Recovery, Hard Drive Recovery Services, Laptop Repair, Laptop Screen Replacement, and Apple Ipad Screen Replacement. 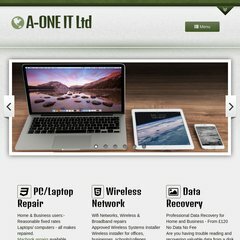 a-oneit.co.uk A-ONE IT - Laptop & Netbook Repairs - laptop screen replacement ..
a-oneit.co.uk A-ONE IT - low cost disk data recovery, disk data recovery, laptop ..
a-oneit.co.uk PC repairs, web site design, web design, networking, upgrades ..
a-oneit.co.uk A-ONE IT - computer and laptop repairs, manchester leeds sheffield .. It has 2 DNS records, ns2.livedns.co.uk, and ns1.livedns.co.uk. It is hosted by Fasthosts Internet Limited - Uk S Largest Web Hosting Company (England, Gloucester,) using Microsoft-IIS/6 web server. The programming language environment is ASP.NET. PING www. (213.171.218.74) 56(84) bytes of data.